To keep your contacts even more protected, turn on Cleaner Pro to save every single change in your contact list, even when you are not using the app. 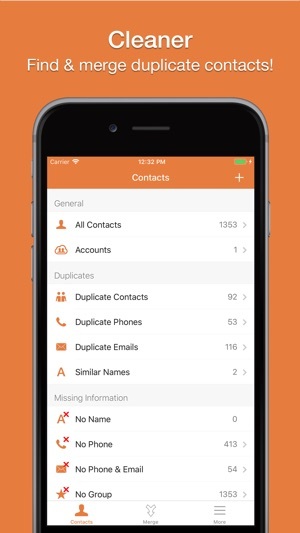 Cleaner Pro allows you to restore your contacts from any mobile device for $9.99 a year through an auto-renewing subscription. You will be surprised how 'Cleaner Pro' can upgrade it! I don’t think I’ve ever wanted to write a 5 star review more than I have for this app. It is a life saver my mom had 2000 + contacts from years and years of switching phones and literally had 5 copies of every contact. It was dreadful trying to delete them through iCloud, so I googled how to delete multiple contacts when this gem showed up in a blog. Wow am I glad we downloaded this. What we had already been working on for an hour and gotten no where, this app came in and saved the day, and many more days by consolidating all those 2000+ contacts into exactly 303. I literally can’t contain my happiness and how happy mom was. 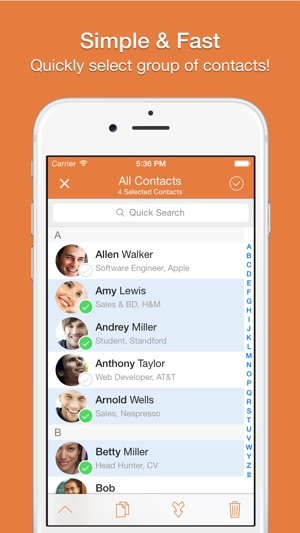 Her contact list was an eyesore and now it’s super tidy thanks to CleanerPro. It works how it says it works. ***BEWARE 1 THING: When it finds similar names, they sometimes are very loosely related and they are actually 2 different people. The most severe example: I had “Enzo Yyyy” and “Enzo Zzzz,” their last names were both stored, they are 2 different Enzo’s, and they needed to stay separate; it tried to combine them into 1 contact. Just remember to click into each contact that it is combining to make sure “Josh Smith” isn’t being combined when they are 2 different threads. I wish that it would, at that point, see if you had 2 different text or email threads with those contacts. At that point it would give you the option to combine before lumping them in with the assumed duplicates. 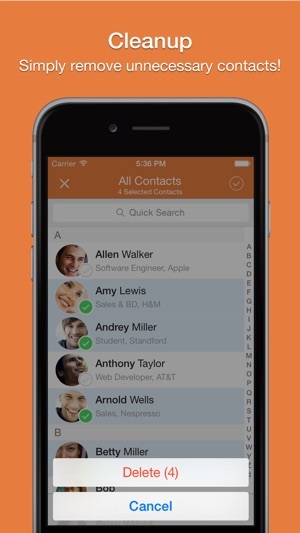 If u r consolidating Google, Yahoo & other old contact lists that have duplicated to your iPhone, this app I found is exactly what I was looking for in the first 5 minutes. Like an Excel worksheet sorted and filtered ready for you to merge with many options but better..and you choose what you want the app to do before losing important information. 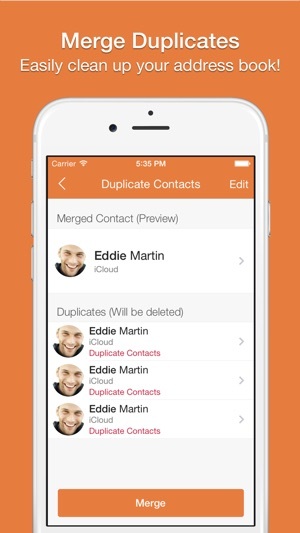 I chose to view each duplicate contact it found before choosing 'merge'. You can change the Name of the contact name that will be saved once merged and send yourself a full .zip file by email attachment before and after making changes-A nice feature.